One of my favourite things about summer is how much sport there is to enjoy – and what a summer this is turning out to be! We’ve already had one of the best World Cups I can remember, Wimbledon (boo! ), the Tour de France, and now, for the next two weeks or so Glasgow is going to be buzzing with the Commonwealth Games. It’s going to be ace, and despite some travel disruption (it took me an extra 15 minutes to get into work today, with all the road closures and diversions) I’m really looking forward to both the events we’re going to (gymnastics, rugby 7s, athletics, road cycling and probably the marathon) and the ones I’ll be watching on TV. 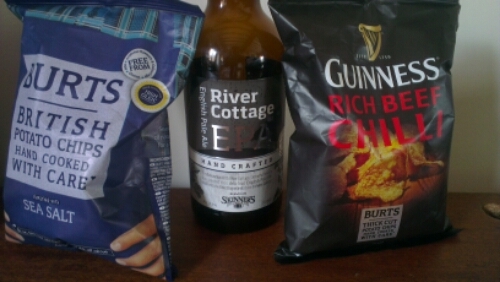 It’s hard work watching all this sport, so I was thrilled to receive a sports fan pack from River Cottage EPA and Burts Chips – just the refreshment I needed! River Cottage English Pale Ale is a new beer developed by Skinner’s Brewery and the lovely people at River Cottage, and one I thoroughly enjoyed, although not as strongly flavoured as the IPAs, red ales and porters I tend to go for these days. The only problem with the chips being so good is they were gone in no time, and now I’ve none left for the rest of the summer. Oh well, guess I’ll have to buy some more. Now for the best bit – I’ve got another one of these packs to give away to one lucky reader! To enter, just leave a comment below saying what your sporting highlight of summer 2014 is/will be. I’ll be picking a winner at 12 noon next Monday (July 28th 2014) so make sure you get your entries in by then. And good luck! UPDATE: Congratulations to Alister Pullen, whose comment (#4) was picked at random by the random number generator at www.random.org.